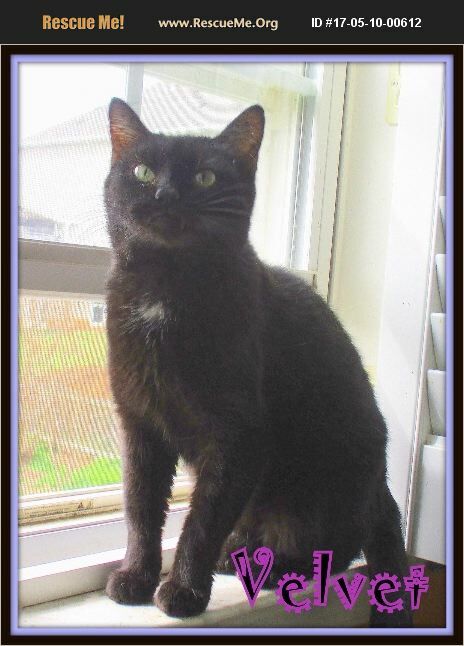 Velvet is a beautiful, petite, silky black, female senior cat, who is estimated to be 8 years of age or older. (Cats can live to be 20+ years old.) She came to us from a high-kill NC shelter, just hours before she and her kitten were to be euthanized. Violet is just sweet as can be, but is a timid cat - not a Violet by any means - just a little timid at first. She likes to hang out by herself, loves to be held and cuddled, and for some reason - though she loves other cats - they seem to pick on her. She is a very tender, emotional soul, who tends to care and groom the other cats. She is a sweetheart! ��%BD'��%BD��%BD Violet is spayed, up to date on rabies and distemper vaccines, and combo tested negative for both feline leukemia and FIV. She would do best in a quiet home, with cat-friendly children over the age of 9 years old. If you are interested in meeting Velvet or would like additional information on this precious girl, please give us a call at 540-825-3744 or email GoodMews22@aol.com.